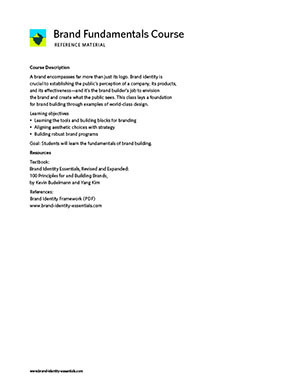 A PDF download of the Brand Fundamentals Course Curriculum featured in our book. It’s the brand builder’s job to envision the brand and create what the public sees. This class lays a foundation for brand building through examples of world-class design. Students will learn the tools and building blocks for branding, how to align aesthetic choices with strategy, and build robust brand programs. Fill out this form to download the course curriculum.